Haq's Musings: Can Indian Economy Survive Without Western Money? I beg to differ. One major source of inflows for Indian market is remittances, which amount to $80 billions. That effectively nullifies their trade deficit. Before 1991. India was a closed economy, highly regulated and protective. After 1991, with liberalization policies, India start growing at amazing pace. I dont know, how much this is sustainable in future, but right now, its in their favor. With huge market and man power, near future looks good for India and it depends upon how their leadership meets the challenges. Rajput: "I beg to differ. One major source of inflows for Indian market is remittances, which amount to $80 billions. That effectively nullifies their trade deficit"
Current account deficit includes worker remittances. India depends upon capital flows to bridge the CAD. Foreign Direct Inflows (FDI) and portfolio investments constitute a major share of the flows. Debt flows, External Commercial Borrowings, in particular, have gone up substantially but, as a share of total capital flows, debt flows have declined from 80 per cent in 1990-91 to about 30 per cent in 2011-12. Total capital flows reached a peak of US$ 107 billion in 2007-08 but collapsed to about US$ 7.2 billion in 2008-09 indicating volatile nature of such capital flows. In the current fiscal year so far, India has witnessed a net inflow of about US$ 25 billion in the form of FDI and about US$ 36 billion as portfolio flows as against about US$ 21 billion and (-) US$ one billion respectively in the corresponding period of the last year. During 2014-15, capital flows would be more than adequate to finance CAD. produces no return by way of exports and portfolio returns. However, I guess I am a small fry compared to your heroes like Jim O'Neill and Lord William Dalrymple, whom you love to quote and you wont believe me. Indian CAD for FY 15 is about USD 36 billion. (Net of Merchandise + Services + Remittances). India's FX reserves are 320 billion USD and rising. As a rule of thumb CAD < 2% is safe. FIIs/FDIs/External Commercial borrowings are over and above this. And no Western private capital doesn't flow for geopolitical reason else China would not be a massive destination for it. That its interests are at odds with the West has been known since at least the mid 1990s. Anon: " And no Western private capital doesn't flow for geopolitical reason else China would not be a massive destination for it. That its interests are at odds with the West has been known since at least the mid 1990s." 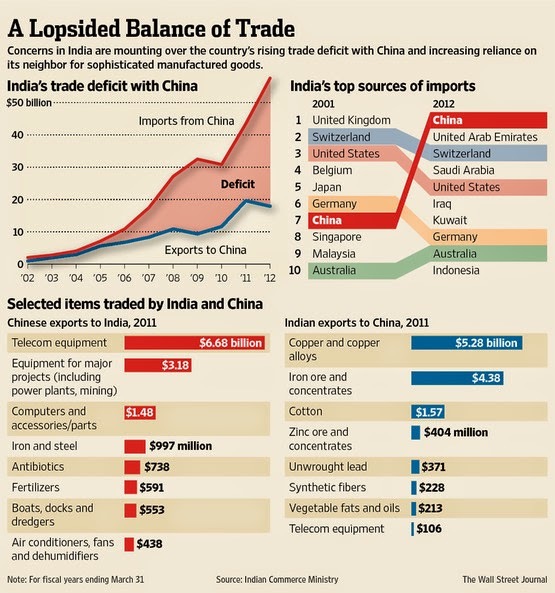 China's rise has been driven by huge export surpluses since mid 1990s, not by FDI inflows. In most recent news by BBC, China's export surplus hit a new monthly record of $60.6 billion in Feb 2015. India is not even in top 10 countries of FDI. So bit surprising why Professor Sahib decided to pick India. No mention of India as one of the countries to be screwed if US increases interest rate. Student: " India is not even in top 10 countries of FDI. So bit surprising why Professor Sahib decided to pick India." India is not in the top 10 but it's the most dependent on FDI because of its large deficits. And FDI inflows in India have surged by 26% last year in spite of slow growth and uncertainties. Although economic growth in developing Asia slowed down, FDI inflows remained resilient. India has huge current account deficits even after taking worker remittances into account. In your recent report, you’ve said that India’s real economic growth is expected reach 6.5% in 2015. What will drive this growth in the medium term? Positive business sentiment coupled with increased household demand and manufacturing output will drive growth to 6.5% this fiscal year. Overall, India is expected to increase growth and to experience lower inflation this year. The country is already experiencing this as demonstrated by its performance in 2014, with the real economic growth reaching 6.0%. In the medium term, India is anticipated to rebound against its economic growth deterrent through its growing middle class, high investment, urbanization and improvement of the business environment and more structural reforms. The demand for consumer goods and opportunities for domestic and foreign investment brought about by India’s growing middle class population of around 70-100 million makes it a market which international companies cannot afford to ignore. If these international companies will consider setting up shop soon and invest in the Indian market, the move will greatly help achieve the expected real economic growth reach of 6.5% in a shorter period. The decline of public debt is also notably significant. If it continues its momentum of exponentially declining like what it has already achieved over the past couple of years, it brings down with it its contribution to the central budget deficit which stands at 4.5% of India’s GDP (gross domestic product) last year. The resumption of stalled infrastructure projects will also help boost India’s growth, especially considering how the industry sector continues to be one of India’s most important sectors—contributing 29% of GDP in 2013. A comparison of the available FDI data to M&A data for India reveals an entirely different picture (figure 2). Countries like the US and the UK together make up 50% of M&A acquisitions into India, and Japan is responsible for another 10%. This triad is effectively responsible for three-fifths of FDI inflows into India (of the M&A variety at least). This provides us a more useful geographic breakdown of who is actually doing the investments in India. A sectoral analysis of FDI inflows suggests that, on average, between 2000 and 2012, more than 35% of FDI inflows have gone into services, telecom and construction sector, with pharmaceuticals, chemicals and computer sector each receiving about 5% of the country’s total FDI inflows over the corresponding period. However, M&A data at the sectoral level for the same time span suggests telecom and pharmaceuticals (and healthcare) have attracted over one-third of the foreign M&A acquisitions in India. Of late, pharmaceuticals has attracted a greater share of M&As, with the sector taking about 20% of inbound M&A acquisitions between 2010 and 2013 (figure 3). What does the foregoing discussion imply for policy? Obviously, first and foremost there is a need for better appreciation of the actual sources and destinations of FDI to and from India as well as the sectoral composition of FDI flows. In fact, while not discussed here, as Indian companies invest overseas more aggressively, better quality data on gross inflows and outflows at country and sectoral levels are needed. Much more attention is also needed with regard to FDI quality at a more disaggregated level (i.e. new FDI versus retained earnings and greenfield versus M&A). While it is important for India to attract FDI, it is pertinent to ask the question whether a policy to attract FDI should be careful in distinguishing between the kind of FDI it wants to attract. All FDI are not the same and are not attracted by the same factors. The prime objective must be to align FDI with national development objectives, consistent with being an open economy. Such flows are driven much more by the changing geopolitics of South Asia region and the world since the end of the Cold War in early 1990s. Are you suggesting that the common investor, John Smith of US, is setting money aside in stocks or bonds for retirement driven by "geopolitics of South Asia" and not because of fundamentals? Sally: "Are you suggesting that the common investor, John Smith of US, is setting money aside in stocks or bonds for retirement driven by "geopolitics of South Asia" and not because of fundamentals?" "John Smith of US setting money aside in stocks or bonds for retirement" knows nothing about international investing; his money is invested by professional money managers who are heavily influenced by US policies and advisories on foreign countries. That's probably why professional money mangers underperform broad market indices over 5 to 10 year horizons. In general, the money managers are interested more in the size of their fees than the ROI of their picks. US corporations are also strongly influenced by US government policies and advisories for international investment destinations. You have been saying that since 2007 when we first crossed swords on chowk.com. Having said that, just because it hasnt happened in the past doesnt mean it wont happen in the future. A farmer on Wednesday committed suicide by hanging himself from a tree in Chief Minister Arvind Kejriwal's presence at the Aam Aadmi Party's rally against the land bill. The man, identified as Gajendra Singh, climbed the tree as top AAP leaders were present at the Jantar Mantar, a stone's throw from Parliament, and hanged himself with a 'gamcha' (towel). As some people climbed up to save him, the branch gave away and he fell. He was rushed to nearby RML hospital in a police jee ..
Is PM Narendra Modi running out of luck? He had famously boasted being a lucky Prime Minister while seeking votes during the Delhi elections. The context, of course, was international oil prices had less than halved and that seemed to have brought all round uptick in economic sentiment, what with the stock markets soaring to new highs early 2015. Consensus among global FIIs was that they will remain overweight India as compared to other markets like China, Brazil, South Korea, Taiwan and Russia. But everything seems to be reversing over the past month and a half. Suddenly the FIIs, with a cumulative investment in Indian stocks of about $300 billion at market value, are looking at other emerging stock markets for returns and no longer treat India as the most preferred destination as they did last year, and even the beginning of this year. FII net outflows gave been of the order of Rs 12,500 crore over the past month. The stock market index has seen the biggest correction of 10 percent in a short time. This has caused speculation whether the markets are slipping into a bear phase. But what is indeed worrisome is India is probably the worst performing stock market among emerging economies this year. This is in sharp contrast to the view taken by the big FIIs that the Modi government reforms could trigger a multi-year bull run in India. Now the same FIIs are shifting the weightage of their global allocation to China where the stock markets have shown 30 percent growth since January. India's Sensex growth remains in negative territory. Even FII inflows, which primarily influence market movement, are flat to negative since January. Worse, now FIIs also seem to prefer oil exporting markets like Russia and Brazil, both of whom had fallen out of favour after the global oil prices had more than halved, badly affecting their revenues. Now the FIIs believe that oil prices are moderately correcting and returning to oil exporting markets like Russia and Brazil makes sense. This view is buttressed by another major consideration. They feel as the US economy recovers and the prospect of monetary tightening by the Federal Reserve brightens, the dollar would strengthen in the short to medium term. The Economic Times has just reported a survey of top CEOs and the majority of them suggest that demand is depressed. "The bonhomie and cheer that greeted the arrival of the Modi government is replaced by a sombre mood and a grim acknowledgement of the realities of doing business in India," reports ET, as it captures the sentiment of the CEOs. Little wonder that this is reflecting in the behaviour of the stock market and currency. The largest engineering conglomerate L&T had said some of its plants are lying idle as demand for capital goods is very weak. The Aditya Birla Group had deferred its revenue target of $65 billion by 3 years, to 2018. These are not good signs for the economy and both the stock market and currency will reflect this in the months ahead. Stupid question! Can China survive without exports? NO! If west goes bust right now, say goodbye to chinese economic boom too and so to CPEC. India doesn’t deserve to be next to China — when it comes to credit rating agencies that is. That’s according to all major credit agencies, which give China a near perfect score — close to the US — and India a near junk score. Fitch, for instance, gives China A+, and India BBB- (see table). India’s credit rating lag behind China is also reflected in credit markets, where the Indian government has to pay almost twice as much as China to borrow money for ten years—see table. That’s certainly upsetting to India’s government officials, who blame credit agencies for favoring China over India. Specifically, they are critical of the agencies for failing to lift India’s credit rating despite its improving economic fundamentals, like robust economic growth rates and fiscal discipline. At the same time, they point to the fact that the agencies have failed to lower China’s rating in spite of deteriorating fundamentals like – the slowing down of the economy and soaring debt to GDP ratio. China has a recent history of current account surpluses and enormous foreign currency reserves, while India has a recent history of current account deficits and moderate foreign currency reserves. This means that China lives below its means, while India lives beyond its means. That’s a situation that may become worse with Narendra Modi’s free cash for everyone, which is expected to turn India into next the Brazil. Persistent current account deficits make India more vulnerable than China to the next global crisis – one that, should it occur, will shift the tides of foreign capital flows from emerging countries back to developed countries—a big concern for the credit rating agencies and foreign investors that rely on them. The bottom line: To move next to China in the credit rate scale, India must learn to live within its own means. India needs to remain vigilant as greater reliance on debt financing and portfolio inflows could create significant external financing vulnerabilities, a recent IMF report has said. The The International Monetary Fund (IMF) in its report titled 'The 2017 External Sector Report' further said other risks to the Indian economy stem from global financial volatility and 'longer-than-expected cash normalization' following the currency exchange initiative. "Like other EMs, too too great a reliance on debt financing and portfolio inflows would create significant external financing vulnerabilities. Therefore, there is need to remain vigilant to safeguard the Indian economy. "...India's economic risks stem from intensified global financial volatility including from a faster-than-anticipated normalization of monetary policy in key advanced economies, longer-than-expected cash normalization following the currency exchange initiative, as well as slower global global growth," the report noted. India's Monetary policy framework has been strengthened, the report said, adding, "but further supply-side reforms and continued fiscal consolidation are key requirements to achieve a low and stable rate of inflation in the medium-term as well as to keep gold imports contained." Emphasising that continued fiscal consolidation is needed, which includes implementation of the goods and services tax and further subsidy reforms, the report s ..
just as development aid had unexpected and significant consequences for India, Engerman argues that the aid policies of the United States and Soviet Union were both primarily defined by the India experience. Essentially both Washington and Moscow learned about the politics and economics of development aid – the potential and the pitfalls – from the process of dealing with India. This was reflected in the changing nature of U.S. aid to India. U.S. assistance began with community development programs in the early 1950s, when technical assistance trainers were sent to Indian villages. India was the largest recipient of U.S. community development assistance during this time. But while big on rhetoric and goodwill, it was accompanied by relatively little financial assistance (just 6 cents per beneficiary per year). In the early 1960s, India asked the Kennedy Administration for funds that were unlinked to projects in order to finance imports, so called “free money.” But instead, as the Cold War heated up, aid became increasingly linked to outcomes and was subject to narrower U.S. conditions, such as on family planning, food aid, and reduced Indian criticism of the Vietnam War. In other words, project aid initially meant to develop the Indian economy gradually evolved to programme aid whose express purpose was to shape Indian policy. The changing nature of U.S. assistance increased donor leverage and therefore presented new challenges to the Indian policy-making community. Among other consequences, it helped ensure that very little technological transfer took place. Similarly, the Soviet approach to economic cooperation in the developing world began with India in the 1950s and was largely driven by Indian conditions. Over time, it eventually assumed a very different character from U.S. aid. During the visit of Soviet leader Nikolai Khrushchev to India, the U.S.S.R. pulled off something of a coup with an agreement to support a steel plant in Bhilai in Madhya Pradesh. This was the first plan of Soviet assistance outside the Communist Bloc, and represented a move away from the relative economic isolationism of the Stalin years. Ironically, India had sought Japanese and West German assistance before turning to the Soviets, and even the Soviet project at Bhilai benefited from components and services provided by Western companies. The shock of the Bhilai announcement forced the United States to increase its support for India, but the Soviet Union soon ran into problems as its own economic growth began to slow. Gradually, Moscow discovered that it had an advantage over the United States in being more open to industrial licensing, which meant that military assistance to India came to predominate. This was accelerated by the U.S. cut-off of military support during the 1965 India-Pakistan War. Yet, over time, as the technological gap between the United States and Soviet Union widened, India found that the over-dependence on Soviet military assistance put it at a disadvantage.